This entry was posted on Sunday, October 2nd, 2011 at 13:23 and is filed under Barack Obama, Breaking News, Culture, Economics, Occupy Wall Street, Politics, War. 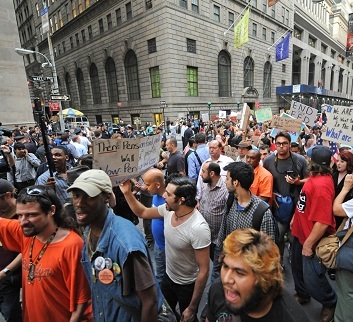 The radicals who are pushing the “Days of Rage” and “Occupy Wall Street” protests are blossoming in other venues. Most of them fit the definition of “useful idiots,” but they’re too ignorant a lot to even recognize that they’re being used. This whole movement is an astro-turf operation being put on by the socialist and communist front in this country. Their leadership has seen the hand-writing on the wall, as the vast bulk of the country is unhappy with the Marxist reflexes of President Obama. What they’re attempting now is to complete the revolution, and with each passing day, the situation grows more dangerous. Whether this is a dry run, or the main event is impossible to determine, but one thing is becoming more abundantly obvious: These protests are not nearly so dangerous as the ideology that now drives and propels the protesters in their rage against capitalism. In my youth, the so-called Cold War was the focus of the struggle between liberty and statism. When the Cold War ended, the communist elements in this country came out of the woodwork and began to push their notions safely in public. Most people viewed them as impotent kooks, but their basic ideas are attractive to some, fundamentally flawed though they may be. Examined closely, what you discover is that their ideas are a collection of platitudes, but they do not answer any of the fundamental questions confronting humanity, except in one sense: What the pleasantries of their ideology leaves hanging in ambiguity is the method by which they are to achieve their utopia, and the answer is always the same: Brutal, naked force and coercion. In the first instance, it is common for people confused about philosophy and politics to fall into the trap of believing that all systems rely upon coercion and force. This is only true when considered in the most superficial manner, but upon closer examination, a stark truth is revealed: Freedom and tyranny apply violence or its threat under very different situations. In a system based upon liberty, violence may be used only as a response to some form of aggression. In any form of statism, violence and its perpetual threat become the sole means of maintaining order. In liberty, it is assumed that all people have certain unalienable rights that are a precondition of their existence. These are generically the rights to life, liberty, property, and volition. In any system of liberty, it is assumed that these are the requisites of a successful life. The only way in which they are yielded is by one’s own choices. To murder or steal are to violate the rights of others, and these are methods by which to yield one’s rights. Living one’s life by one’s efforts and at one’s own expense, while avoiding the violation of the rights of others should bring no negative consequences from society. Such a system can flourish with minimal government provided its people are of a character to abide by these rules. Only the system of capitalism meets the needs of liberty. In any form of statism, it is supposed that men have no unalienable rights, and that the interests of individuals are always superseded by the state. There is no presumption of even the right to life or property, and both are subject to immediate disposal by the state. In this way, in any such system, people are perpetually subject to the arbitrary whims of the will of the state, an invisible, indefinite monster with no limits of any kind. This sort of system appeals to the immoral because it forces them to be good according to some standard they are willing to accept because it suits them, and it suits them so well only because they suspect initially that they will never be the subject of its demands. This is their goal. They wish to push the American people to make that appeal to government. If violence begins in earnest, the calls for the federal government to step in will escalate. This is the excuse for which Obama now waits. Many among us now watch and wonder, believing this cannot go so far as to set aside all we had known in our America. It’s your job to tell them, you who had known better, that the purpose of this spectacle is to steal their rights and all the liberty they had known. It’s time for some frank talk with our friends, family, and neighbors. It’s time to switch off the football game long enough to make this clear to people who haven’t been paying sufficient attention, lest they be drawn in too. It won’t take much to push us over the edge now, and if we are to prevent it, we must prepare them for what is coming, to save their lives along with our own. Yes, it has become as important as that. Yes, it’s time to talk with those around you, and while it may be uncomfortable at first, you may also be surprised at how well they understand. The defense of the Republic should begin belatedly now, and it must begin with you. I left after reading this article feeling a lot more educated. Thanks so much for a writing so awesome. In the 60s the left saw how well the anti-war protests worked along with the aide the American media gave to the movement. we are now seeing the same play just with different actors and a different agenda. The goal is the same, to bring down this counties form of gov. and replace it with socialism. you are doing a great job of educating the people Mark, keep up the great work. I have a nephew who is a Paulbot. He's 50 and yet when i talk to him I am talking to a child. He still lives with his folks. He is very much in favor of this, with out having the slightest idea what it is about. I f martial law is declared his attitude is 'Hey.., so be it". Yet because he is a Paulbot he thinks he is a conservative of sorts. It is frightening how disinformed they are. I asked him what Ron Paul thinks of all this. He shrugs. He's fatalistic about it. These little weekend anarchists never seem to realize that in a real state of anarchy, theirs would most likely be the first heads on the block. Good Lord. Like Bill Ayers, leader of the terrorist weathermen and SDS groups who were busily building and using nail bombs against Americans in an effort to bring down the United States government, Russian immigrant Frances Fox Piven and late husband Richard Cloward have been calling for violence since the sixties. Piven moved to the US from Canada and received her education at the University of Chicago. She is a long-time member of the Democrat Socialists of America. Cloward-Piven advocated using the American welfare state to implement revolution. Make people dependent on the government, overload the government rolls, and once government services become unsustainable, the people will rise up, overthrow the “oppressive capitalist system”. Collapse the system and create a new one. We already have a popular uprising Frances. It’s called Tea Party Americans, and it beats any socialist nightmare you can dream up. We will defend and restore our Republic, and we will do it lawfully and on our own dime. We won't waste taxpaper dollars stinking up the streets while trampling on the rights of others like your useful idiots are doing in NY. Right on C. A. Bamford! Bet my bottom dollar that George Soros has his hands all over this, too. He has had a hand in helping to topple several governments. We know that he is O's puppet master. We want an election in 2012. These people will do whatever it takes to not have an election in 2012 because they know that all their plans for the destruction of our U.S. Constitution and having O as a dictatorial leader of a Socialist U. S. will come to an end. In this war, we have the power of prayer and the pen. We need to maximize the use of both of these weapons, as these kids will now be joined by unions and there is a great possibility that violence will insue as their protest grows across the U.S. Their desired outcome is martial law, the suspension of our U.S. Constitution, and no election in 2012. In this war, I'm beginning my prayers with a call for and early winter and heavy snow to drop on these 'anti-America' 'demon-straters' to get them off the streets. Wirh the power of the pen, I'm is using my social media outlets, like Twitter, to get articles, such as this one, out to help educate the people about what is really happening. C.A. Bamford has brought you a portion of the plans for a Socialist takeover of our government. Investigate George Soros to get a bigger picture of how things will play out. These people need to be stopped before the George Soros plan of action takes a violent course and we have to defend ourselves, our government, and our U.S. Constitution with more than prayer and the power of the pen. Damn it man! This is my first visit to your blog, found it via Adrienne's Catholic Corner. Yet you're saying many of the same things I've voiced a fear of the past few years. That would include a manufactured crisis leading to martial law, suspension of most of our laws, etc. I don't see anything about reeducation camps but I'm sure they're also a part of your scenario.